Dip both sides of meat/chicken in egg mixture and let it drip off, then coat in breadcrumbs, pushing breadcrumb mixture into the meat/chicken. 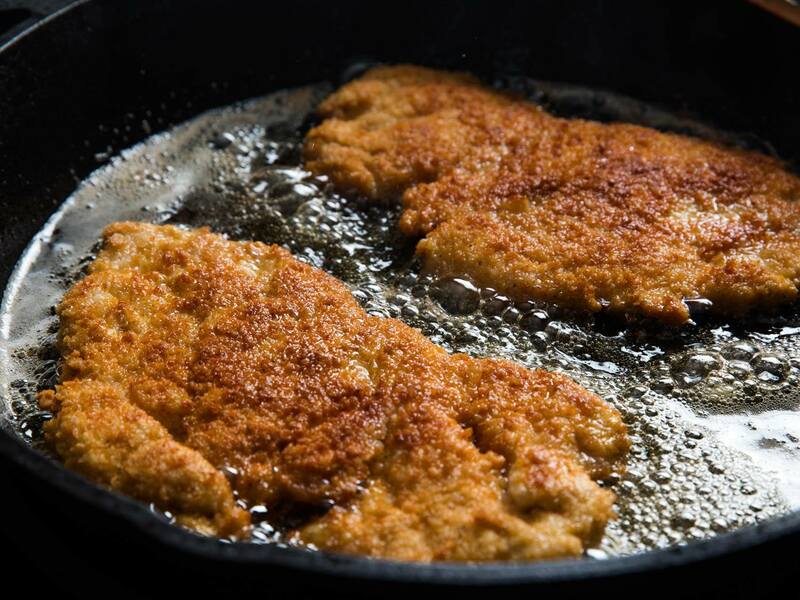 Make sure oil is hot (meat will sizzle when put in if oil is ready) and fry cutlets until golden brown making sure that heat is not too high and burning them. If making parmesan, simply add sauce and grated mozzarella cheese and pop in the oven till cheese is melted. NOTE: You can make fried chicken (with bones) with this recipe by adding more oil to the pan (about 1 -2 inches of oil mixture). Fried chicken with bones will need to cook for about 20 minutes. You can test for doneness by using a meat thermometer – the internal temperature of 170 degrees for breast and 180 degrees for thighs and legs.